We have just completed an in-depth voyage of Discovery in Greece, onboard the Azamara Journey. Embarking from Athens, we called on the Greek ports of Mykonos, Paros, Santorini, Crete and Katakolon, before heading north to visit Montenegro, Croatia, and Italy. We've enjoyed the benefits of Azamara's longer stays in port, often having the opportunity to go to the beach during the day, then return to town in the evening. There are many reasons why cruising is a wonderful way to explore Greece. Some of the highlights include connecting with the locals, learning about the history of Ancient Greece, and enjoying Greek hospitality, food and wine. 1. Ancient Greece. Celebrating the past in Athens, Chania, and Olympia. Landmarks in Greece are plentiful. 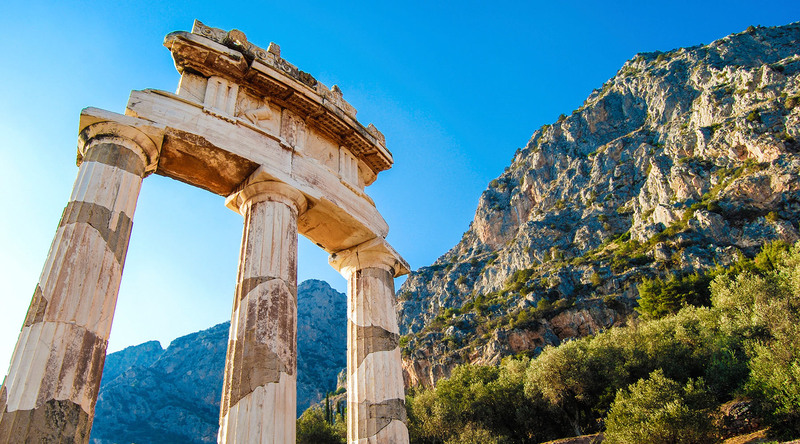 Make sure to spend time exploring the city of Athens exploring the wonders of ancient Greece. Not to miss are the Temple of Zeus, the Parthenon, and the Acropolis. While cruising Crete, the Azamara Journey anchored off Chania - an advantage of small-ship cruising, as that is not possible for large ships. In Chania, a day can be spent strolling around the old port exploring and shopping. There are many details not to be missed, and a walking tour is recommended to get maximum immersion learning about the history that includes Greek, Venetian, and Ottoman influences. Also included on this Greek Isles itinerary was a call to Katakolon, a 40-minute drive from Olympia. The Azamara Shore Excursions tour is a great option for touring Ancient Olympia. Be prepared to see the ruins of the stadium, temples, and monuments located at the archaeological site and museum. 2. Enjoy the sun, sand and surf in Mykonos and Paros. Swimming the clear waters of the Aegean is perhaps one of the reasons why travelers choose to cruise Greece. The Cruise Global, Connect Local shore excursions department on Azamara Journey offers a couple of beach excursions and in some ports, like Mykonos, getting to the beach on your own is a realistic option. If you choose to go it alone, make sure to stop by Deck 4 lobby area to get insider tips and port information from a representative from the tourism department. Get a local map and tips for how to maximize time in port before heading ashore. In some ports, Azamara offers complimentary shuttle service into town if the ship is docked or tendered far from the action. A note about enjoying the beaches in Greece: bring some cash to rent a comfy sunbed for shade. 3. Glorious Greece – an escape to whitewashed villages like Oia and Mykonos. There are certain iconic landmarks in Greece that must be seen. Two of my favorite views in Greece are the windmills in Mykonos and the white houses that are typical of the area and can be found in many of the villages on Mykonos and Santorini. Last time I visited Santorini I did not have enough time to get to Oia. With more time in port during this voyage, I was able to make my way to the Village of Oia in the late afternoon to see one of the most beautiful places in the world. 4. Good eats in Greece. The traditional foods and recipes of Greece are famous. The Mediterranean diet is alive and well in Greece and at the center of the table is wine, olives, and fresh seafood. Executive Chef Monica spent some time in a local market in Chania, Crete where she was able to procure tuna that was grilled and served for the onboard White Night event. Dishes that I sampled and enjoyed include a meat pie called kreatopita, and tzatziki, a dip made of Greek yogurt, cucumber, chopped garlic, salt and pepper, and fresh chopped mint. If you are out in town at a local watering hole make sure to enjoy some small plates of appetizers known as mezedes. I also had Baklava Gelato during a Cruise Global, Nights Local tour in Santorini, during which I learned how to make the delicious frozen treat. Chef Monica and her team have done a great job helping connect passengers with the cultures of the destinations Azamara visits through her varied menus and special touches onboard. Since the Destination Immersion® concept is at the epicenter of an Azamara cruise experience, be prepared for a robust onboard program that is designed to maximize discovery. From the music, movies, shows, food, wine, tours, and ports, passengers will get a sense of place and an invitation to travel deeply. One of the highlights of our journey was the AzAmazing Evenings piano performance by Andreas Boutsikakis in Chania, Crete. The local musician played an outdoor concert located a the stunning setting outside the walls of the Kioutsouk Hassan Mosque. The mosque was built in the late 1600s and named for the city’s first Ottoman commander to rule during Turkish occupation of the island. Feeling inspired? Browse upcoming voyages to the beautiful Greek Isles. Carrie Finley-Bajak is a travel expert and founder of cruisebuzz.net. Carrie is an Experience Ambassador for Azamara Club Cruises, and blogs about our immersive onshore experiences.